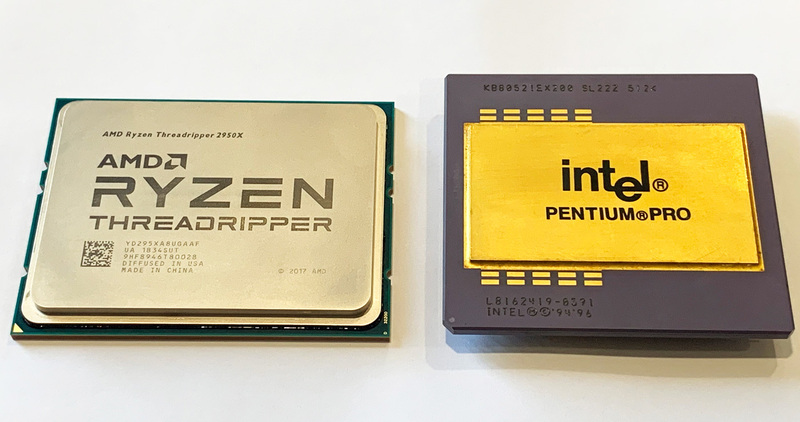 Far not often, manufacturers of server hardware provide an opportunity to choose the work of processors or RAM in non-standard conditions or in overclocking. 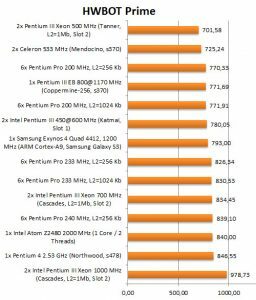 From my personal experience, I can say that my favorite manufacturer of this kind of equipment is Asus, its motherboards for workstations, for the most part, give a choice, which was confirmed by me in previous articles. 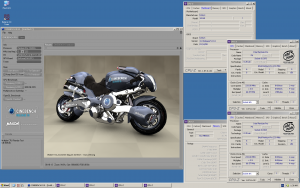 With ALR Revolution 6×6, things are a little more complicated. 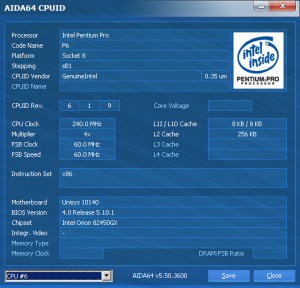 If the overclocking capability was 100% dependent on the BIOS capabilities of the motherboard, then overclocking could be forgotten. But he came to the rescue – jumpers! 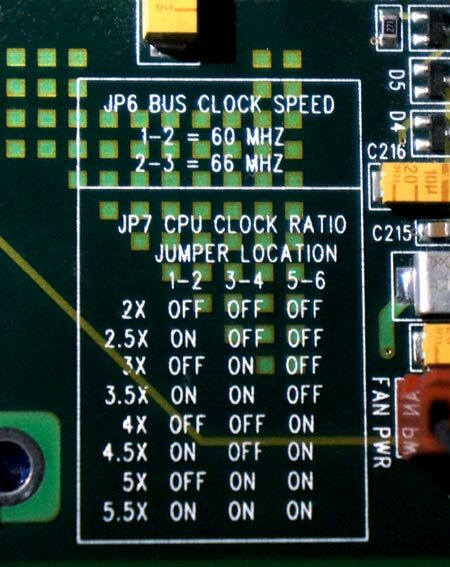 Jumpers are an overclocker’s best friend (s). Popular wisdom. And it’s good when they are. 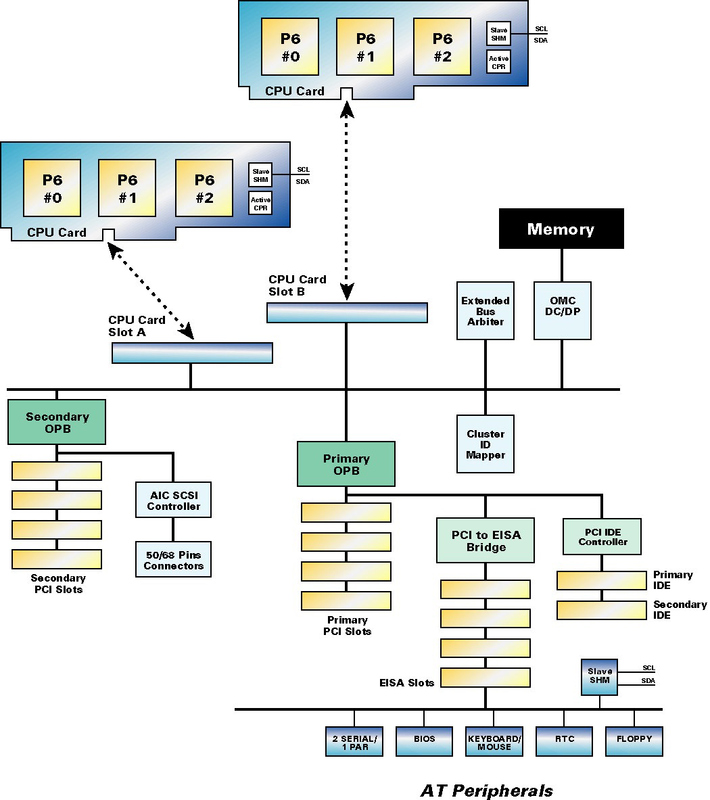 If you refer to the manual of the motherboard, then you can see just such a selection plate of the CPU multiplier using the jumper combinations. 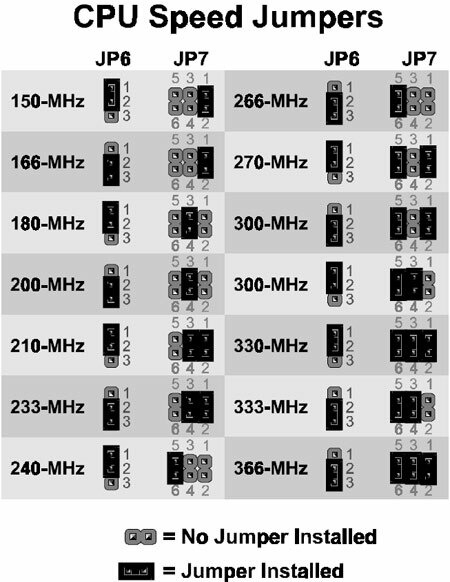 A total of 14 options, of which half is responsible for the choice of FSB, the value of which can take two options: 60 and 66 MHz, the rest are responsible for the multiplier. 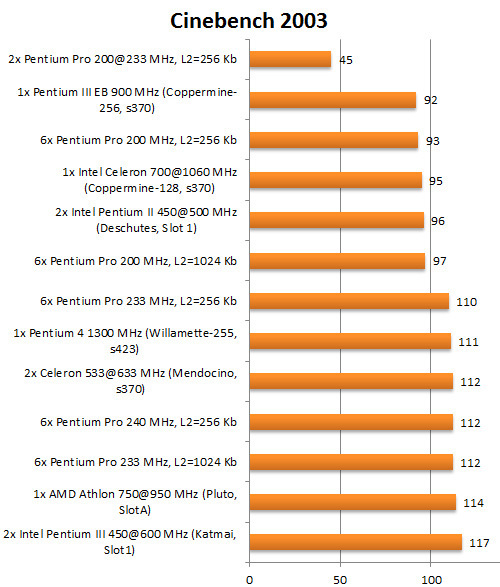 As a result, the Pentium Pro, which has a free multiplier, can hypothetically be overclocked to 366 MHz. But I’m afraid for these figures will require at least liquid helium. 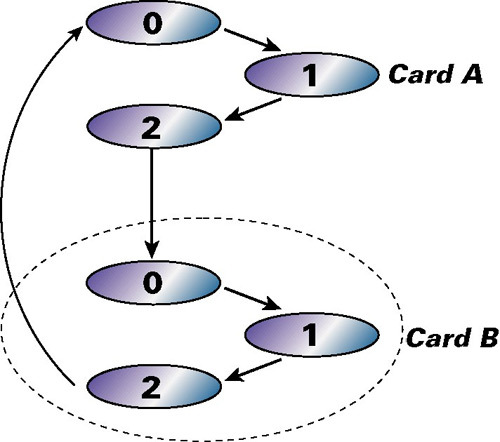 It’s really quite impressive that ALR chose to implement such a large range of multipliers. 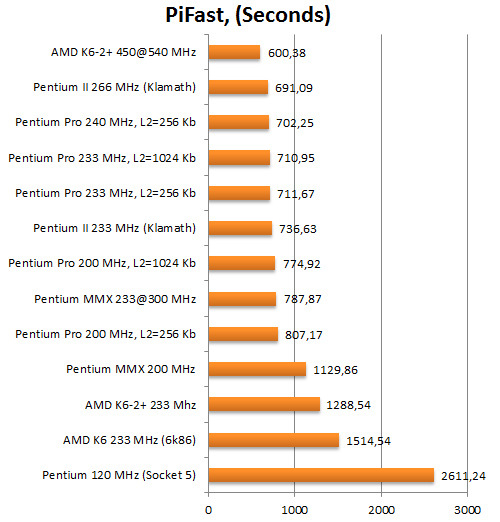 Perhaps they were hoping for more to the Pentium Pro then Intel made. 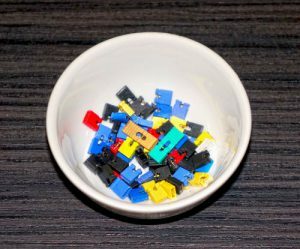 A similar plate is applied on the PCB of the server’s motherboard itself. 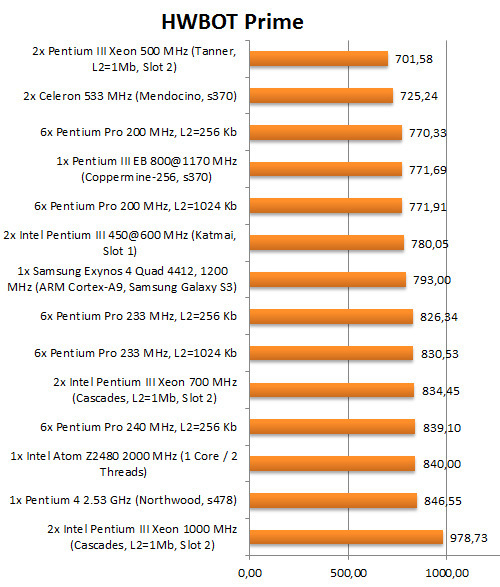 More processors did not want to overclock. 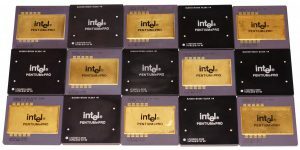 Then, after squeezing out a half-tube of thermal paste, on a new batch of test subjects, and the paste is needed for such areas decently, I installed radiators on six Intel Pentium Pro CPUs with a frequency of 200 MHz and 256 KB cache, that is, four times smaller. 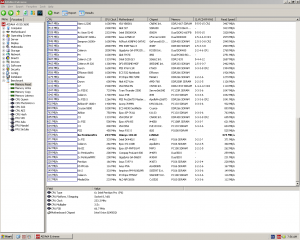 Forgetting to return the jumpers to the place from the previous start, I saw 233 MHz on the screen. 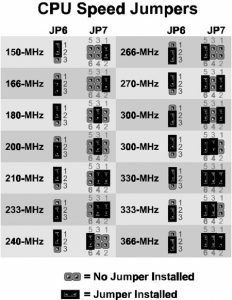 The next step was the frequency of 240 MHz according to the formula 60 x4 and it was taken! Good luck and this time did not disappoint. 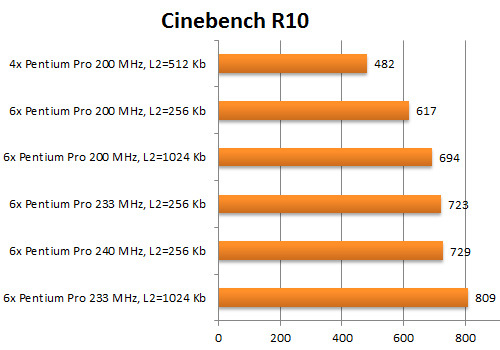 And this is already plus 20% of the performance for each processor. The next mark was supposed to be 266 MHz, but alas, I saw only a black screen. This frequency did not submit to the six samurai. 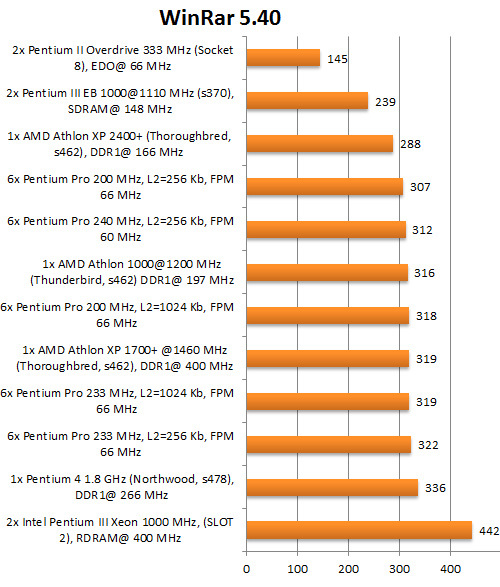 But even 240 MHz is a decent figure for so many CPUs. It remains to find out the last – performance in the tests! Kingston SSDNow V300 (60 Gb). 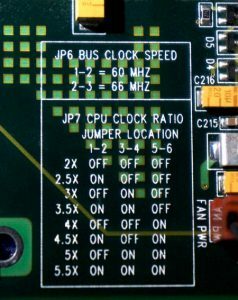 To get warmed up, a pair of single-flow tests: Super Pi task 1M and PiFast. 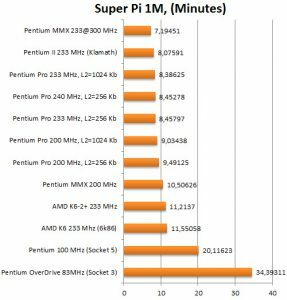 If you compare the performance of the Pentium Pro with a clock frequency of 200 MHz and just a Pentium with a frequency of 100 MHz, you can see more than 2 times the superiority of the server version of Intel. The L2 cache size affects the final result. 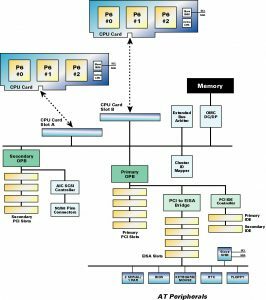 The processor with a frequency of 240 MHz could not beat his colleague with a frequency of 233 MHz with a 4 times larger L2 cache. 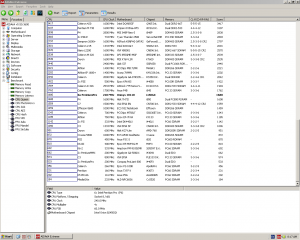 Here we see that the limiting factor was mainly memory bandwidth. 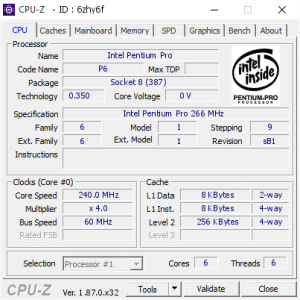 The PPro at 233MHz with 1MB of cache was able to outperform the 240MHz 256K model as it was running on a higher bus speed (66MHz vs 60MHz) and had to go to main memory for data less (as more could be cached on chip) At the same time, no one Pentium Pro managed to reach Pentium II with a frequency of 233 MHz (Klamath). 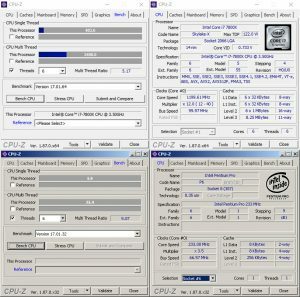 A Pentium I overclocked using extreme cooling to 300 MHz becomes the winner of this round, despite the absence of an onboard second-level cache. In this test, the 300 MHz frequencies did not bring Pentium-I wins, and even the Pentium Pro outperformed the equivalent Pentium II (Klamath). It would seem that two similar tests, but different algorithms. But these tests were for illustrative example, of course the whole ALR Revolution 6×6 POWER in supporting multithreading, here will be where to turn. 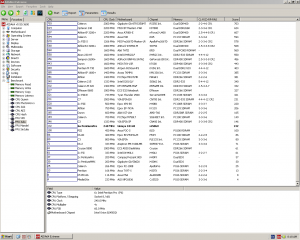 CPU Cores, like physical processors, do not happen much, do they? Six Pentium Pros turned out to be faster in their default state than a pair of the very first Pentium III with a frequency of 500 MHz in the Slot 1 form factor, and even faster than a pair of 550 MHz Xeons with a weighty L2 cache of 2 MB in the form-factor of Slot 2. 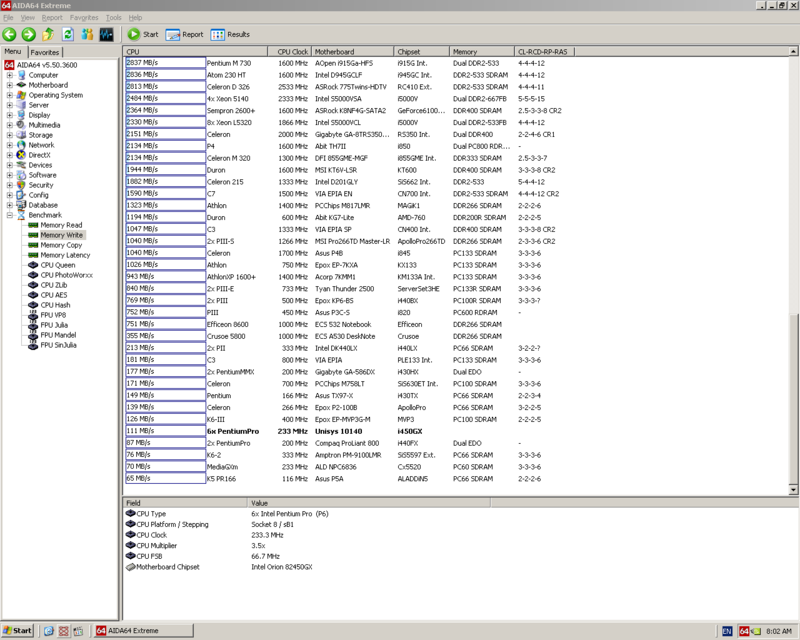 But a single 1 GHz S462 AMD Athlon with Thunderbird core turned out to be faster. 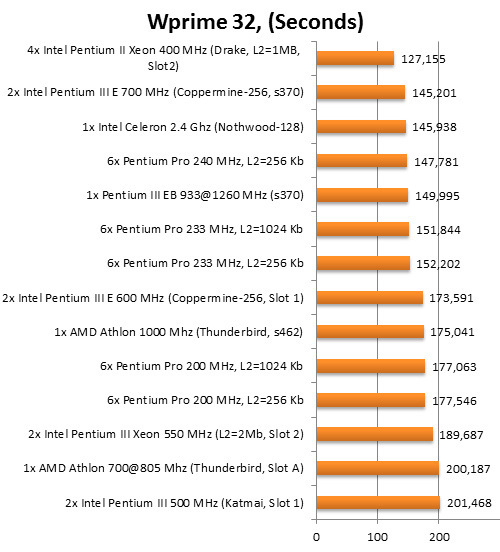 Acceleration of each processor by 16.5% or +1 additional processor overtakes a pair of Pentium III E with a clock frequency of 600 MHz on the Coppermine-256 core. 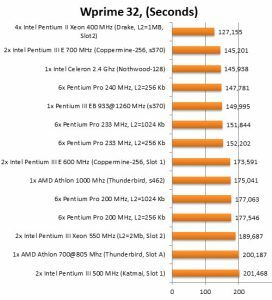 And six Pentium Pros with L2 = 256 Kb can compete on an almost equal basis with Celeron at 2.4 GHz on the Northwood core, which went on sale in March 2003 at a price of $127. If you count, then since the appearance on the market of ALR Revolution 6×6 only 6 years have passed. Progress spares no one, even monsters like the ALR Revolution 6×6. 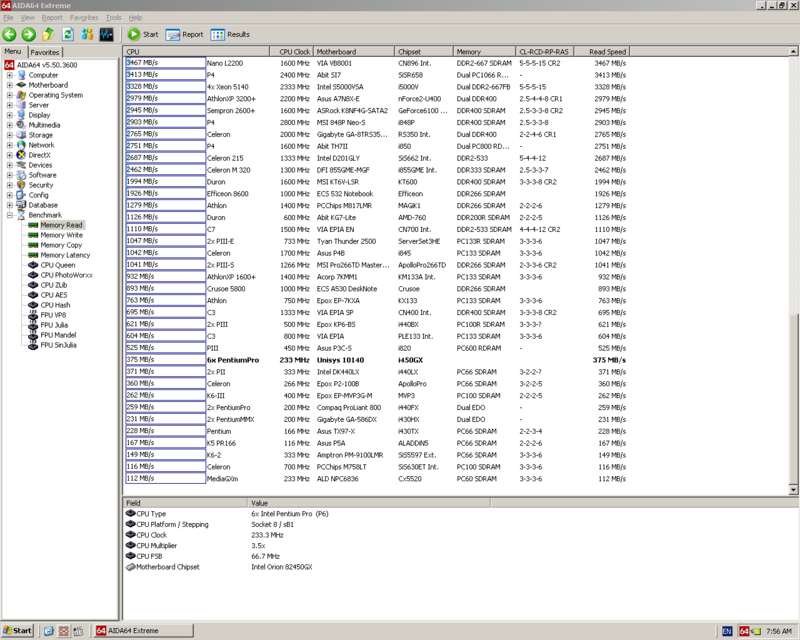 Running this Java test was made possible thanks to my Windows OS miracle. The results are of course very funny, otherwise they can’t be called LOL. 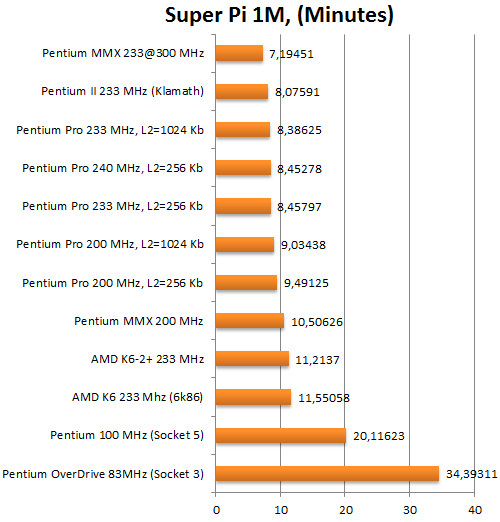 Bear in mind that Java only came out in 1995 just a few months before the Pentium Pro was released. Drop the comparison with two Pentium III Xeon and take a look at the neighborhood of six 200 MHz Pentium Pro and Samsung Galaxy S3 on the already old ARM Cortex-A9 with four cores with a frequency of 1200 MHz. What can we say about modern flagships that will not leave a stone unturned from the superserver of those years. And if such a performance is divided by the mass of devices, then ALR Revolution 6×6 in this ratio certainly will not have a chance. 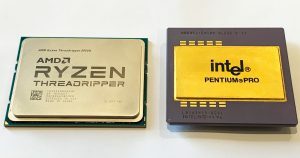 Another very nice look is a couple in the form of an Intel Atom Z2480 processor for mobile devices with a frequency of 2 GHz, with one core and Hyper Threading technology and the overclocked to the limit Pentium Pro with a frequency of 240 MHz. This “baby” size 12×12 mm and TDP equal to three Watts! 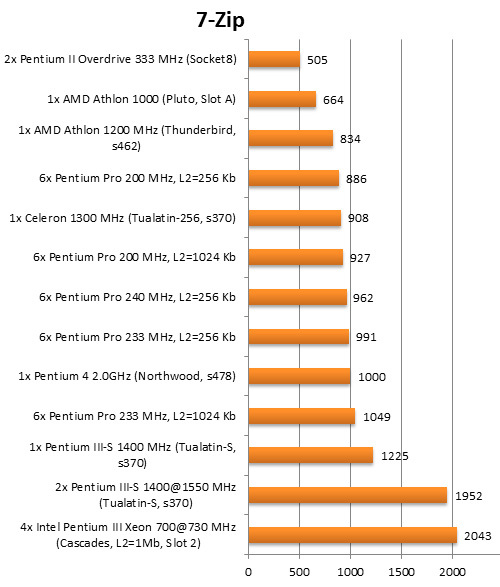 comes on equal terms with six processors of their past. The rest of the comments are superfluous. Performance indicators in archiving data from a test system are more than decent, it was possible to overtake even 2 processor systems with faster more modern RAM, which are far ahead in their speed characteristics the ancient Fast Page Mode memory. 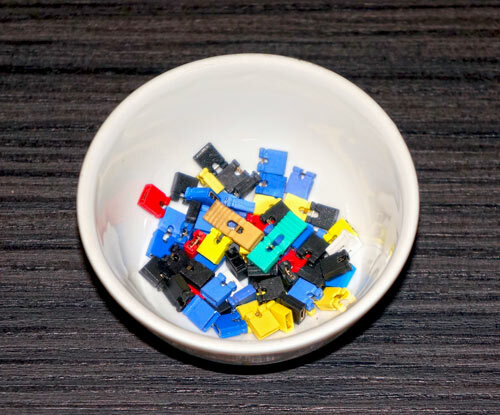 In this test, it can also be stated that all 6 processors did not lose face. Even against the background of two Pentium II Overdrive 333 MHz, they look good. 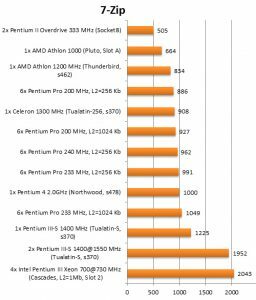 Cache memory also contributes to the final result, as does the FSB frequency, which did not allow six 240 MHz Pentium Pros to rise above the 6x 233 MHz Pentium Pros. Below in the picture is a screenshot from AIDA64. Reading from the memory of this system at a very good level, but that cannot be said about the speed of writing to memory. 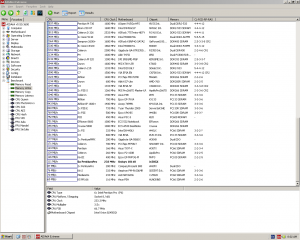 The test system turned out to be more than 7 times faster than a Pentium with a frequency of 166 MHz and 3.15 times faster than a Compaq ProLiant 800 server with a pair of 200 MHz Pentium Pros. 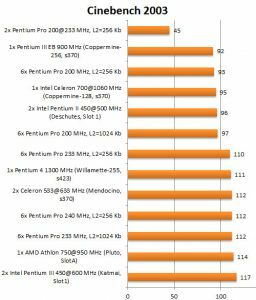 Similarly, 6 processors overclocked to 240 MHz are faster than a Compaq ProLiant 800 server with a pair of 200 MHz Pentium Pros. 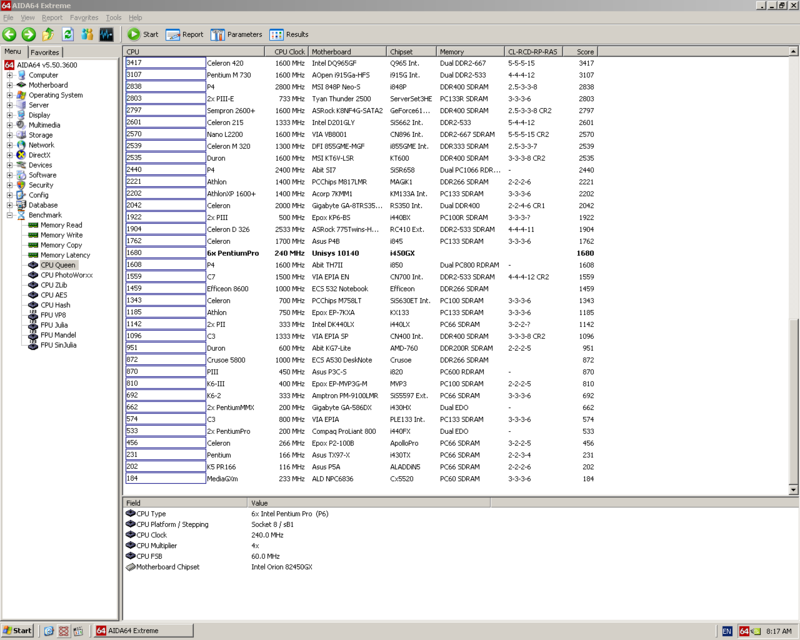 And of course the test Cache and Memory Benchmark. 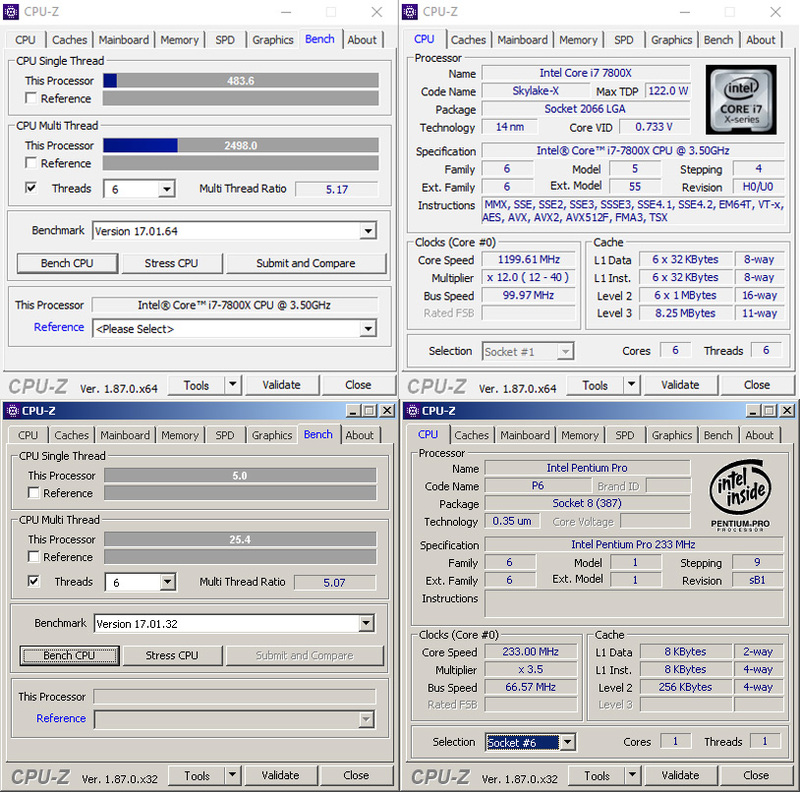 From left to right: Pentium Pro 200 MHz (L2 = 1024 Kb), Pentium Pro @ 233 MHz (L2 = 1024 Kb) and Pentium Pro @ 240 MHz (L2 = 256 Kb). To the question on what is better to produce the final rendering. Very responsive test, it is a pity that we could not find similar results, but the graph shows that the final result depends on both the clock frequency and the amount of cache memory of the second level processor. As additional information for reflection, I will write the total time to complete this test. 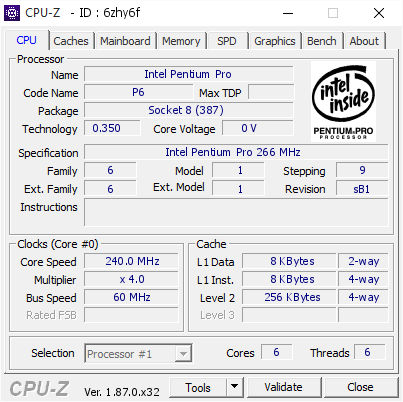 So the Intel Core i7 7800X performed the final rendering in 20 seconds exactly, and for the same task, the six Pentium Pros took 21 minutes and 14 seconds. Like this! Well, perhaps that’s all, all promises are fulfilled, the results were very interesting, there is something to think about and think about, I have nothing more to add to them. I hope the half a year spent time on this project was spent not in vain. 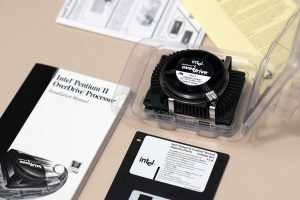 The issue with the Intel Pentium II Overdrive 333 MHz remains open, but I still don’t lose hope for the second part of this article. 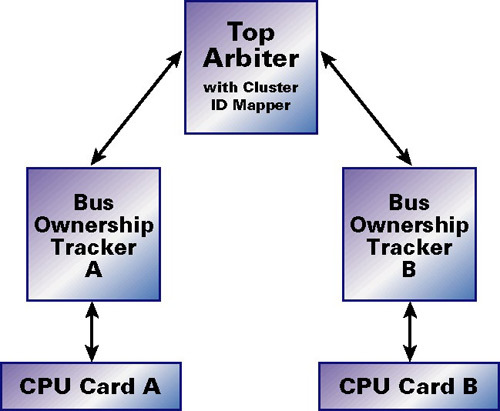 Once we find 6 working Overdrives we will see what a revolution that provides in the ALR 6×6. And most importantly, can they be overclocked? A very interesting experiment and a true demonstration of patience and determination. Thanks for sharing your work and congratulations. It cannot. 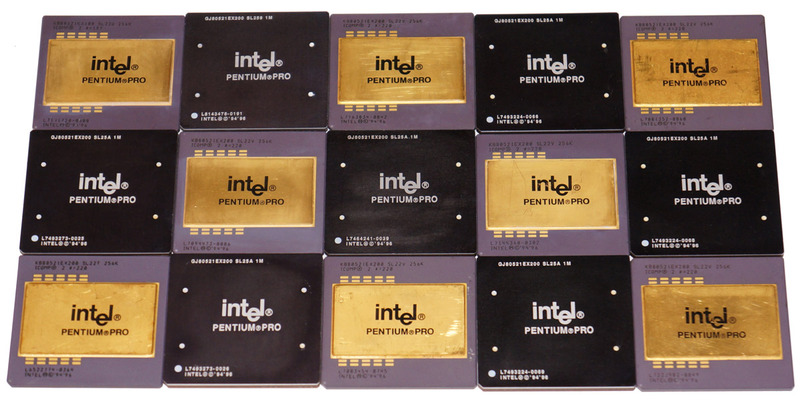 The Pentium Pro treats multipliers above 4x as 2x. 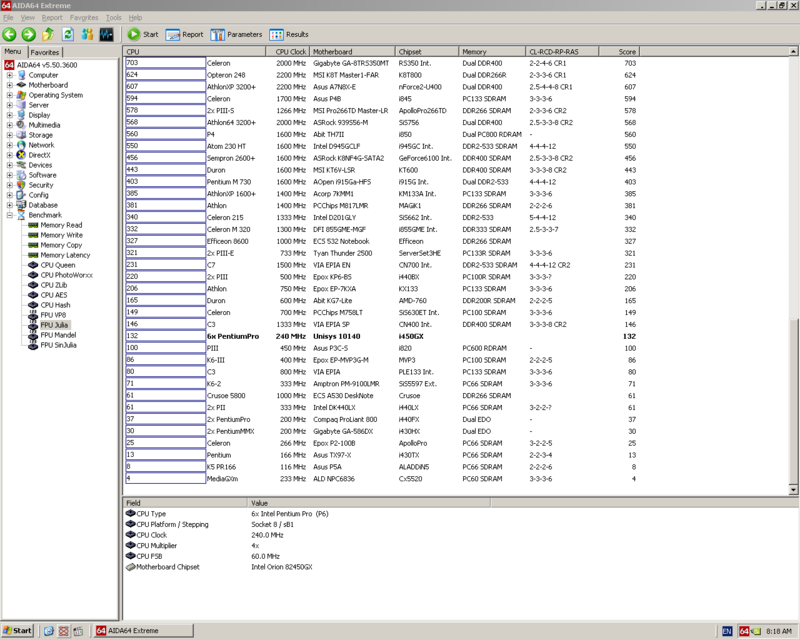 266MHz is as high as it can go on the 66MHz system bus. It takes a bit of luck to find a 512K chip that can actually operate at 266MHz. 256K and 1M are nearly hopeless.